When popular Christian author and blogger Rachel Held Evans came to Eastern Mennonite University last week, one student cleared her schedule. First-year seminarian Lindsay Davis was at each of Evans’ appearances: morning chapel, an afternoon reading and discussion with an undergraduate Anabaptist Biblical Values class and an evening lecture. Reprising themes she explores in her books, Evolving in Monkeytown (Zondervan, 2010) and The Year of Biblical Womanhood (Thomas Nelson, 2012), and on her popular blog, Evans repeatedly urged faith communities to nurture diversity and honor differences. That message was one that Davis also wanted to celebrate. Similar feelings brought audience members to Harrisonburg from as far away as Pennsylvania and Indiana. Evans’ thoughtful, often humorous explorations of her evangelical faith and the Christian tradition have earned her both controversy and acclaim. She’s appeared on The Today Show, NPR, Oprah.com and in a host of national newspapers. She was named one of Christianity Today’s “50 Women to Watch” in 2012. During a chapel talk titled “Keep the Church Weird — Millenials and the Future of Christianity,” Evans said that she’s often asked to speak about reasons why teenagers and twenty-somethings are leaving the church. Though at 32, she barely qualifies as a millennial, Evans thinks her popular blog (in one month last year, it received more than 272,000 visits) has come to resemble what the younger generation wants in a church: a haven for fellow-seekers and fellow-questioners, where alternative viewpoints are welcomed and explored. Clearing that path to God means letting in – and leading the way for – the marginalized, the poor, the “least of these” (Matthew 25:40), including the LGBT community, Evans said during an afternoon discussion with an Anabaptist Biblical Perspectives class. She is not merely stating her own beliefs, but sharing those of many millenials, according to polls by the Barna Group and Pew Forum. “What gives you hope?” asked Bible faculty member Carmen Schrock-Hurst at the end of the Q & A session. Afterward, Schrock-Hurst said it was an honor for the campus to host Evans. 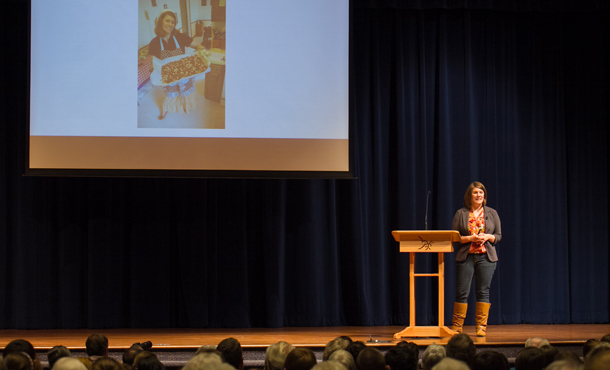 Evans’ evening presentation about her bestseller, The Year of Biblical Womanhood, drew a near-capacity crowd to Lehman Auditorium. The book chronicles Evans’ year-long exploration of the Bible, during which she searched, exhaustively and humorously, for a single, cohesive formula of what it means to be a Christian woman.